Natural & artificial flavor. Prebiotic fiber to support a healthy digestive system. With prebiotic fiber. Contains 9 grams of total fat per serving. From PediaSure: No. 1 pediatrician recommended brand. 240 calories. 7 g protein. 3 g fiber. Nutrition to help kids grow. DHA omega-3 for brain and eye health. Gluten-free. Suitable for lactose intolerance. Call 1-800-986-8505, or visit PediaSure.com for more general information. 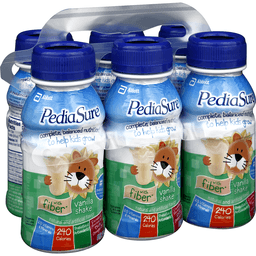 PediaSure Feeding Expert: Live nutrition support for picky eaters. Dietitians available at 800-986-8798. PediaSure.com. 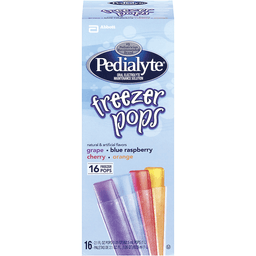 Pedialyte® Freezer Pops Electrolyte Solution Variety Pack. Pedialyte # 1 Pediatrician recommended brand. Abbott. Replaces electrolytes. Grape, blue raspberry, cherry, orange. Natural & artificial flavor. Trusted by doctors and hospitals Since 1966. Pedialyte® quickly replenishes fluids and electrolytes lost during diarrhea and vomiting to help prevent dehydration. Electrolyte sodium in Pedialyte® compared to common beverages. Level per liter. Pedialyte. Sports drink. Soda. 100% Apple juice. Water. No fruit juice. Pedialyte is formulated with an optimal balance of sugar and sodium to help prevent dehydration. Use Pedialyte® rather than juices, soda or sports drinks which contain too much sugar and can make diarrhea worse. 1 serving (63ml) of Pedialyte® freezer pops provides: sodium, 2.8 meq; potassium, 1.2 meq; chloride, 2.2. meq. Questions or comments call 1-800-986-8441. Visit us at www.pedialyte.com. Packed by the makers of Fla-Vor-Ice®. ©2015 Abbott Laboratories.